The Good Natured, aka 19-year-old Sarah McIntosh, have been kicking around for a couple of years now. 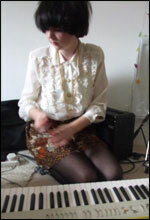 Her initial demos, recorded in Christmas 2008, were picked up by Radio 1's new music guru Huw Stephens. They were literally the first songs she wrote and, she says now, "I don't think they're very good". Two years later, and she's started to perfect her style. Think primal, tribal pop. Florence & The Machine without the cauldron and pagan sacrifice. Or Marina and the Diamonds with the clattering percussion of Adam And The Ants. In fact, she's been working with Marina's producer Liam Howe, so there's a definite stylistic similarity. Her lyrics tread a more shadowy path than Marina's problem page ponderings, however. "I write songs about wishes, desires, hopes, secrets and love," she says. It sounds innocent enough - but her last single was based around the macabre couplet: "Your body is a machine / It will break like you've broken me". Teenagers, eh? The Good Natured's new single, Be My Animal, is out this week. McIntosh told Steve Lamacq it was "about having a physical relationship with somebody and wanting it to be an emotional one". The video director has taken a slightly more literal interpretation and filmed a rabbit. There is more of this sort of thing on The Good Natured's MySpace page.